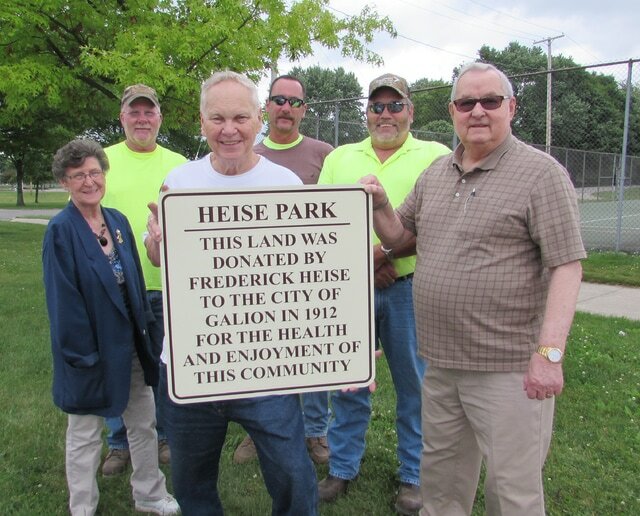 Galion Historical Society member Rich Henry holds one of the new signs for Heise Park. He stands with Parks and Streets Chair Shirley Clark, members of the Service Department and Safety-Service Director John Swain, far right. Ever wondered how Heise Park got its name? Three new signs were installed at the park this week to answer that question for visitors. Note: Heise’s land only consists of the main portion of the park containing the football stadium, public pool, playground and baseball fields. The portion of the park located north of the Galion Community Center YMCA was once part of the Gill family’s farm. Rich Henry, a member of the Galion Historical Society, said he had been wanting to put up signs for a long time. “This park has always been a nice place to come. I want younger generations to know why it’s here,” Henry said. He talked to Safety-Service Director John Swain to see what could be done, and the city agreed to make the new signs. They are located on Heise Park Lane at both the east and west entrances, as well as the Jefferson Street entrance beside the tennis courts. The Service Department installed them today.